Single horse carousel holiday light display. This combination of garland and lights is sure to add to your outdoor Christmas decorations display both day and night. Create the wonderment this Christmas season with commercial holiday light displays from eDecorSource. 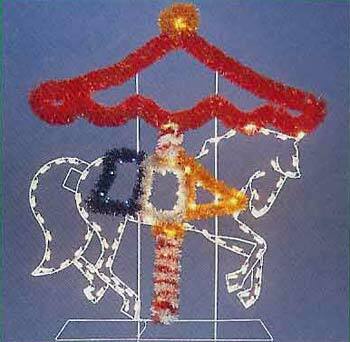 Animated and non-animated 5 Horse Carousel Light Displays also available. Animated display also available, item number 5CAROUSELA listed in our animated displays section; item number 5CAROUSEL.